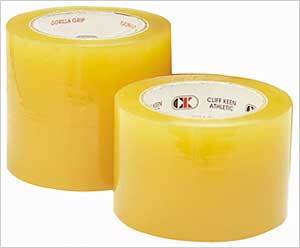 4" Cliff Keen Wrestling Mat Tape - No Gummy Residue & Powerful Grip! Cliff Keen Wrestling Mat Tape: Specifically designed adhesive gives powerful grip to mat. Leaves no gummy residue. Reusable many times. Each roll individually wrapped. 8 mils thick. Color: Transparent. Size: 4" x 84'.